Provide comfort for the family of Mae Sawyer with a meaningful gesture of sympathy. 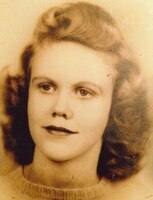 Mae Holcomb Sawyer, 91, passed away March 19th, 2019 at Dermott City Nursing Home in Dermott, AR. She was born April 20th, 1927 in Tillar Arkansas. Mae was preceded in death by her husband of 67 years, Kelly Sawyer; her parents, Reaves and Olevia Holcomb and one sister, Anna Henley. She is survived by her daughter, Anne Stuart (Tommy) of McGehee, AR and son, Coy Sawyer (Sook) of San Francisco, CA; her grand-children, Kane Stuart of Sherwood, AR, Anson Stuart (Autumn) of Lonoke, AR and four great-grandchildren, Kade, J.T., Graham and Slade Stuart. Mae worked many jobs including an operator for Bell Telephone Company and a clerk at Klasers and Merle Norman in McGehee, AR. We would like to give a special thanks to McGehee-Desha County Hospital, Dermott City Nursing Home and Arkansas Hospice for their love and care. To send flowers in memory of Mae Holcomb Sawyer, please visit our Heartfelt Sympathies Store. Provide comfort for the family of Mae Holcomb Sawyer by sending flowers.